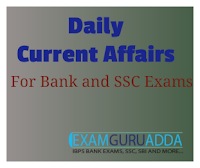 Dear Readers, we are presenting Daily Current Affairs for All Exams- 9th December 2016. 1. According to the 2016 Global Terrorism Index (GTI) India was ranked 8th among 163 countries in the list of most impacted by terrorism in 2015. The fourth edition of the index was released by Sydney-based think-tank Institute for Economics & Peace. 2. India is one of six Asian countries ranked in the top 10 nations most impacted by terrorism. 3. According to GTI 2016, Iraq was the worst hit by terror in 2015 followed by Afghanistan and Nigeria. Pakistan was ranked fourth. 1. The Food Safety and Standards Authority of India (FSSAI) has banned use of newspapers for wrapping and packing of food items. In this regard, FSSAI has issued an advisory all states and Union territories and asked commissioners of food safety to restrict the use of newspapers for packing, serving and storing of food items. 2. This is first time in recent years FSSAI has issued new rule related to packaging of food items. So far, it had focused on setting standards for packaged food. 1. India has been designated as a major defence partner of the United States. It puts India on a par with the closest allies and partners of the US. The agreement in this regard was reached between Union Defence Minister Manohar Parrikar and US Secretary of Defence Ashton Carter in New Delhi. 2. It was one of the last visits from a cabinet member of the outgoing Obama administration. So far, US has bestowed this status upon the North Atlantic Treaty Organisation (NATO) countries and the US treaty allies such as Japan, South Korea, Australia, New Zealand and Philippines. 1. The Union Government has announced package of incentives and measures for promotion of digital and cashless economy in the country. It was announced to supplement the surge in the digital transactions aftermath demonetisation of old Rs.500 and Rs.1,000 notes for promotion of digital cashless economy and cutting out cash transactions. 1. Former US aviator, astronaut John Glenn passed away in Columbus, Ohio, US. He was 95. He last surviving member of the Mercury Seven Mission. He was first American to orbit Earth and had circled three times earth in 1962 aboard Friendship 7 space capsule. 2. His achievement marked the moment in US space history as during that time it was caught up with the Soviet Union in manned space exploration. 1. The international financial institution, World Bank has cancelled a $100 million loan to Pakistan that was meant to be for a natural gas efficiency project. 2. The loan was cancelled, as the gas distribution company that was responsible for the project, failed to make any progress in achieving its developmental objectives and showed very less interest in the project overall. 3. The company in question is Sui Southern Gas Company (SSGC) and it was supposed to initiate the project in its distribution areas located in Karachi, Balochistan, and interiors of Sindh. The main aim of the project was to increase the supply of natural gas in the designated areas by reducing gas loss in the pipeline system. 1. The International Anti-Corruption Day 2016 was observed across the world on 9 December 2016 with the theme United against corruption for development, peace and security. 2. The day was observed to raise public awareness about corruption and what people can do to fight it. 3. On the occasion of the International Anti-Corruption Day, all the Governments, the private sector, non-governmental organizations, the media and citizens around the world joined forces to fight the crime.